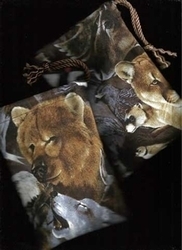 Regular Tarot Bags - Wolves Regular Tarot Bag - Tarot Bags, Tarot Cards, Cloths, & More! 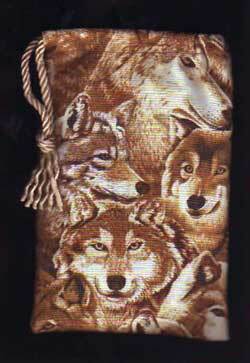 Absolutely covered with wolves, this fabric makes a wonderful bag for shamanic or nature oriented decks. Profiles and frontal views of the faces of wolves allow the owner to connect with the animal world even before opening the bag to draw the tarot deck out. 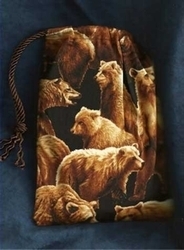 If you use tarot or oracle decks with animal images, then this is the ideal bag to house one of them. 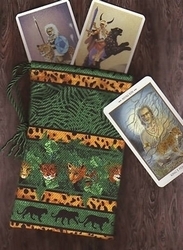 Some appropriate deck choices include Animals Divine Tarot, Vision Quest Tarot, Animal Wise Tarot, Native American Tarot Decks and Cards, Wolf Pack Cards, Shaman Wisdom Cards, the Fantastical Creatures Tarot, or the Wolf Song Cards. Choose one of several colors for your cord. The cord shown in the pictures is Shell. 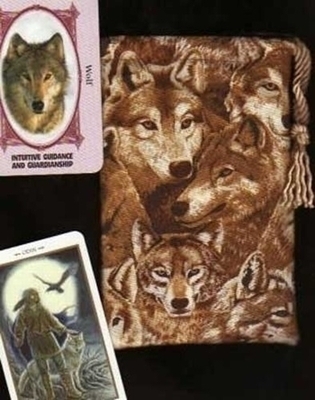 Wolf Symbolism: The Wolf points to a strong connection with instincts, sharp intellect, and intuition. Creatures of incredible loyalty and strength, wolves, like humans, are social animals. Romulus and Remus, the legendary founders of Rome, were suckled by a she-wolf. In Norse myth the Wolf is a symbol of victory, ridden by Odin and the Valkyries into battle. Size: Measures approximately 4� inches wide by 7� inches tall. 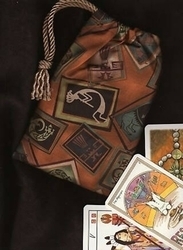 Fits most standards sized tarot and oracle decks (about 3" x 5").